A virus is a germ-based enemy found in the Dr. Mario series. Viruses come in five colors: red (Fever, which can manipulate heat), blue (Chill, which can manipulate cold), yellow (Weird, which can transform people into different shapes or species), cyan and magenta. 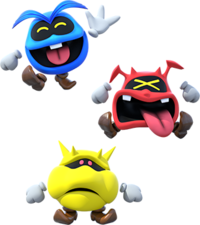 While the red, blue and yellow viruses appear in all installments of the Dr. Mario series, cyan (Dizzy), magenta (Confused), and an alternative yellow virus (Drowsy) are exclusive to Dr. Luigi. To defeat a virus, Dr. Mario must line up three Megavitamins of the same color next to the virus of that color. The virus, along with the Megavitamins, will then disappear. After clearing one jar of viruses, Dr. Mario will move to the next one, with each jar containing increasingly more viruses. Viruses first appeared in the NES and Game Boy game Dr. Mario, where they are small germs that Dr. Mario must eliminate. To do this, he uses Megavitamins, which can come in combinations of their colors (red, blue, and yellow), four of these Megavitamins must be stacked on top of a virus of the same color to eliminate it. As the difficulty increases, the number of viruses also increase. In the Game Boy version due to the system being incapable of displaying bright colors, viruses appear in black, white, and gray. The black virus resembles the red virus, the gray virus resembles the blue virus and the white virus resembles the yellow virus. Because the simple monochrome display of the Game Boy is only able to show a few shades of gray, the black and gray viruses lack the black sclera that the red and blue viruses had, and hence look a tad different. In the high-level ending, the viruses are seen on a tree before being beamed up by a UFO. They are found in the remakes Tetris & Dr. Mario and Dr. Mario & Puzzle League for the Super Nintendo Entertainment System and Game Boy Advance respectively. Viruses from Dr. Mario 64. Viruses appear again in Dr. Mario 64, and they play the same role as before. The way to beat them stays the same, too. In Flash mode, regular viruses are immune to Megavitamins, and special flashing viruses appear that can be defeated. Viruses also appear in the WiiWare game Dr. Mario Online Rx, where they act like they do in Dr. Mario. They are also seen fighting Miis in the Virus Buster game. The alternative yellow virus, Drowsy. Three new viruses with two new virus colors, cyan and magenta, appear in the Wii U game, Dr. Luigi, exclusive to the Nintendo eShop. The classic blue, red, and yellow viruses appear in the "Retro Remedy" mode by default, while the new viruses and an alternative "Drowsy" yellow virus appear in the new Operation L mode by default. The colors of the viruses in this game are based off CMYK printing colors. Basic gameplay of Dr. Mario mode. The standard three viruses return in Dr. Mario: Miracle Cure, in the same role as past games. Even though Dr. Luigi and the Operation L gameplay return in this game, the new viruses seen in Dr. Luigi do not. The viruses appeared as the main antagonists in Nintendo Comics System's adaptation of Dr. Mario entitled "The Doctor Is In... Over His Head". It was this appearance that named the red virus 'Fever', the blue virus 'Chill', and the yellow virus 'Weird'. In the same episode, the viruses are given special powers: Chill can manipulate the cold, Fever can control heat, and Weird can forcibly morph others into different shapes and creatures. Two viruses can briefly be seen inside Bowser's stomach in the Club Nintendo comic "Süße Weihnachten". They symbolize his sickness after having eaten too much. Viruses in Dr. Wario, featuring a different look. In WarioWare, Inc.: Mega Microgame$!, one of 9-Volt's microgames called Dr. Mario is based on the game Dr. Mario, and the player must defeat the viruses using Megavitamins, just like in the game. There is also a minigame in the same game called Dr. Wario, which is a Wario version of Dr. Mario, where the viruses look different. In WarioWare: Twisted! in the microgame Weird Science, a blue virus makes an appearance. In WarioWare Gold another Dr. Mario microgame appears and features Viruses. Viruses appear as enemies at Woohoo Hooniversity in Mario & Luigi: Superstar Saga and its 3DS remake. They appear in all three colors and attack in groups. When hit by Mario or Luigi, they will change into a different color. When a red virus is hit, it will become a blue virus; when a blue virus is hit, it will become a yellow virus; and when a yellow virus is hit, it will become a red virus. Once all viruses in-battle match in color, they will be instantly destroyed, which is a callback to how they were destroyed in Dr. Mario. Additionally in the remake, when 3 of them are defeated at once, a small portion of the Fever theme plays as well. Viruses attack by charging at Mario or Luigi and chewing on their heads, which can be countered by using the hammer. Sometimes when a brother fails to counter this attack, he will be poisoned. Each color is stronger than the other, with yellow being the strongest and red being the weakest. When using an Advanced Swing Bros. attack against a yellow virus or defeating it with the Game Boy Horror SP equipped, it will drop a Steady Badge. The blue virus makes a minor cameo in Mario & Luigi: Bowser's Inside Story and its 3DS remake. After knocking out all the body segments of a Toothy, the Toothy attacks by spitting out a blue virus holding a small spear to attack the player. In the Toadley Clinic's lobby, there is a prohibition sign on the wall featuring a blue virus. Viruses appear in Mario & Luigi: Dream Team as enemies. In the field, viruses chase Mario and Luigi upon sight. Viruses also change color whenever they are damaged (with the exception of counter-attacks); much like how they did in Mario & Luigi: Superstar Saga. The pattern they go in is from blue to yellow to red and back to blue again, repeating itself. The player can connect three or more of the same color to make them disappear, defeating the connected viruses instantly, also like in Mario & Luigi: Superstar Saga. If a virus is defeated, the ones behind it will move forward to the front if possible. They always appear in a group of 16, which is the most enemies seen in a battle in the real world. They are also one of the very few enemies who can inflict the Mini status on the Bros. which decreases their Attack and Defense and shrinks them. Viruses may attack by forming two lines, one in the foreground and one in the background, and proceeding to move several steps in any direction each time. This can be dodged by jumping when appropriate. Viruses may also attack by circling the Bros. in a single file line, Mario and Luigi then having to hammer them all into a pile before they attack them after circling several times. If three of the same color land on the pile consecutively, they disappear like they would normally. If they are jumped on, they change color twice and if the hammer is used they will change color once. Also, if Mario or Luigi had the tiny status with DEF-Down they will be KO'd no matter what because the number damage is 1411. This could also give them a Game Over very easily. Red viruses can inflict POW-Down, yellow viruses can inflict DEF-Down, and blue viruses can inflict SPD-Down. In the Mario Kart Arcade GP series (including GP 2 and GP DX), there are two blue Virus related items: Wheel Virus and Dizziness Virus. The first and third titles include both, while the second only has the Dizziness Virus. The Viruses in Nintendo Puzzle Collection. The Viruses reappeared in the Dr. Mario game (a close remake of Dr. Mario 64) of Nintendo Puzzle Collection. The Scientist page from Super Mario Bros. & Friends: When I Grow Up. Viruses appear as enemies in the unlockable minigame Virus Buster (also known as Germ Buster) for Brain Age 2: More Training in Minutes a Day!, which was later included in Dr. Mario Online Rx and all subsequent titles in the Brain Age series. Viruses also make a small cameo in the obscure Super Famicom game Motoko-chan no Wonder Kitchen, appearing in a cut-scene for mayonnaise 'facts'. They also cameo in Nintendo Monopoly, appearing on one of the Coin Block (Community Chest) cards. Viruses are also referenced in Super Paper Mario when a Shayde says he was killed for an illness caused by multicolored viruses. Of all the virus colors, the blue virus is the one with the most appearances and cameos. Viruses come in five colors: red, blue, yellow, cyan and magenta (Fever, Chill, Weird, Dizzy and Confused, respectively). In most of their appearances, the red, blue and yellow viruses are bipedal, wear brown shoes and white gloves. In addition to their color, viruses can be distinguished by their appearances. Red viruses are the most distinctive, having floppy, round ears, two small horns that curve inward, yellow eyes, a mouth containing two teeth and a tongue, a spiked tail and a nose. According to the Tetris & Dr. Mario instruction manual, the red virus is female, making it the only one until the introduction of the magenta virus in Dr. Luigi. Blue viruses have large, spiked ears, no horns, yellow eyes, and a mouth containing a single tooth. Yellow viruses have two pairs of horns instead of ears, orange eyes, and no visible mouth. The cyan and magenta viruses lack legs and feet, yet also have distinct appearances: cyan viruses have large eyes with gold irises, two small antenna-like features on the top of their head, and a large mouth with four fangs and a long tongue. Magenta viruses have a square-shaped body with three small horns on the top of their head and slightly mottled skin, large eyes with eyelashes and magenta irises, segmented arms with mitten-like hands, and a large mouth with no visible teeth or tongue. In the NES version of Dr. Mario, when the player beats the game with the level and speed set to 20 and high respectively, a cutscene will play showing a UFO flying over a tree with the three viruses, who then enter the UFO, hinting that they might be aliens of some sort. The UFO also appears before the title screen of Dr. Luigi. Viruses are contagious, to the point that one of them can multiply to fill an entire glass jar within seconds. According to the Nintendo Comics system, each virus has unique abilities that correspond with their names: red viruses can manipulate heat, blue viruses can manipulate cold, and yellow viruses can transform people into different shapes and species, which is referred to as "weirdness". In the Mario and Luigi series, viruses are able to change their color when attacked, and are shown to wield spears. Lining up four viruses of the same color using Megavitamins removes them without a trace. Wii Dr. Mario Online Rx (05/2008) At the forefront of medical science, you have to be equal to whatever nature throws your way–that's why Dr. Mario's medicine cabinet includes red, blue, and yellow capsules to combat these red, blue, and yellow viruses! Over 20 years after Mario first took up medicine, Luigi joined the fight with his new L-shaped vitamin. At the forefront of medical science, you have to be equal to whatever nature throws your way - that's why Dr. Mario's medicine cabinet includes red, blue and yellow capsules, for any colour of virus. If you can't visit Dr. Mario, at least go and see Dr. Luigi, who set up his first practice more than 20 years later. For this subject's image gallery, see Gallery:Virus. This page was last edited on March 10, 2019, at 10:33.